I came across this obnoxious blog today which I really don't want to promote in the slightest so I'm not going to mention what it is or what it's about. (and this image has nothing to do with it either...it's a random image I got from Googling "30 Days") Anywho...it gave me an idea, that I should try to write 90 plot ideas in 90 days. 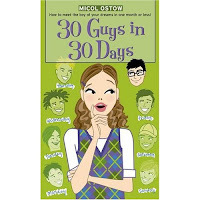 However, that being a long time, I think I should pare it down to a more reasonable 30 days. Do I have to write one plot each day or can I skip & make up? Do they need to be consecutive days? Should I get other people involved/committed ala NaNoWriMo? I could probably post something up on the NaNo boards. What do I do with the ideas when I'm done? I was thinking about what would happen if Barak Obama suddenly announced that they were expecting a baby. I did the math, and then realized that the baby would probably be born around election day. Apparently a baby has only been born once before by a President in Office, Ester Cleveland in 1893. Now of course a baby being born Nov. 4, 2008 wouldn't count as a "Whitehouse Baby" but I think it would make for a very interesting campaign. I can just see him saying, "my first job upon being elected Leader of the Free World is to do something no other President has done in over 100 years: install a nursery." And to cap things off, there could be a Lindbergh-style kidnapping plot, perhaps by Terrorists (or political rivals) seeking to destroy his life. The entire nation would be riveted by the plot, almost to the point of turning into a civil war with accusations and finger-pointing. Hmm...what if it turns out to be the estranged wife all along? (or a jealous lover of some kind) I was reading a little about Grover Cleveland. Apparently he married a 21-yo women IN OFFICE and then had the baby. He was a draft-dodger during the Civil War (paid the gov't to NOT serve) and also apparently had an illegitimate child at some point along the way. He also lost an election after getting the majority of votes (like Gore in 2000).